Driving in bad weather can be challenging, but fitting all-season or winter tyres can make driving in cold, wet or snowy conditions easier and safer. Key differences between all-season, winter and summer tyres? Summer tyres: Summer tyres give better driving stability around corners and improved breaking distances in warm, dry driving conditions. Winter tyres: Best for temperatures that frequently dip below freezing. Winter tyres should carry a Three Peak Mountain Snow Flake (3PMSF) or Mud and Snow (M+S) symbol. The M+S symbol indicates that a tyre gives superior handling in snow and mud, however 3PMSF means that the tyre has passed EU regulations for performance requirements on snow. Many manufacturers recommend tyres with the 3PMSF symbol for driving in wintry conditions. All-Season tyres: Combining the longevity and safety of a summer tyre, with the traction and braking performance needed for wintry conditions, all-season tyres offer great all-round performance. All-Season tyres are useful if you live somewhere that doesn’t experience extreme weather conditions during winter, or if it is not possible for you to store an additional set of tyres. What are the laws around winter and all-season tyres? There are no legal requirements in the UK to fit winter or all-season tyres in sets of four, however mixing the tyres on your vehicle can cause issues with stability, leading to problems with cornering and spinning. Whether you choose winter or all-season tyres depends on certain factors, including how you drive and where you live. You might find that all-season tyres are more practical for the weather experienced in Britain vs separate winter and summer tyres. Do you live in a city or a rural area? What are weather conditions like in your area? Do you mainly drive during the day or at night? Do you drive your car abroad? 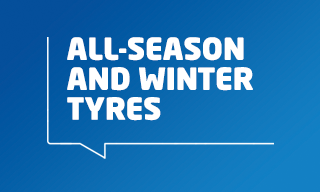 As with all tyres, the cost of all-season and winter tyres varies depending on your car and wheel size. Our online tool can help you find the right tyre for your vehicle, or you can visit a Centre to speak to one of our experienced Technicians. If choosing winter tyres, you’ll need to consider the cost of storage at a tyre hotel if you don’t have anywhere to store your spare set. You’ll also need to consider fitting costs when changing between you winter and summer tyres (recommended in September and April). Neither of these additional costs will apply if you choose to fit an all-season tyre. Fitting winter or all-season tyres shouldn’t affect your insurance as the Association of British Insurers confirm that they are not considered a car modification, however it’s always best to confirm this with your insurer directly. By switching to Michelin CrossClimate+, you’ll also benefit from longer lasting tyres – in independent tests, Michelin CrossClimate+ lasted longer than both all-season and summer tyre competitors*. *1 Test conducted by DEKRA TEST CENTER, at Michelin's request, between June and July 2017, on dimension 205/55 R16 91V on VW Golf 7 comparing MICHELIN PRIMACY 4 and MICHELIN CROSSCLIMATE+ versus latest Summer competitor tyres available at the time of testing: BRIDGESTONE TURANZA T001 EVO, CONTINENTAL PREMIUM CONTACT 5, DUNLOP BLURESPONSE, GOODYEAR EFFICIENT GRIP PERFORMANCE and PIRELLI CINTURATO P7 BLUE. Longevity test run in average real usage (D50) with 10.000 km run and estimated longevity at 1.6mm. All Season tyre test conducted by Autobild, published September 2018, on 195/65 R15, comparing Michelin CROSSCLIMATE+ versus latest All Season competitor tyres available at time of testing: GOODYEAR VECTOR 4 SEASONS Gen-2, CONTINENTAL ALLSEASONCONTACT, NOKIAN WAETHERPROOF, HANKOOK KINERGY 4S2, FALKEN EUROALL SEASON AS210, VREDESTEIN QUATRAC 5, NEXEN N’BLUE 4 SEASON, PIRELLI CINTURATO ALL SEASON PLUS, BRIDGESTONE ALL WEATHER CONTROL A005. MICHELIN CROSSCLIMATE+ was number one for longevity.